A different variety of sage collected from Interior, South Dakota. 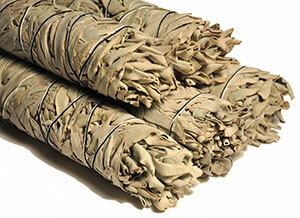 We call it "Badlands Sage" because Interior is right next to Badlands National Park. The common name for this species is Silver Sagebrush. It is said that the Lakota use this ceremonially as a protection against evil influences by burning and for making bracelets from it for the Sun Dance (from Grassland Plants of South Dakota and the Northern Great Plains, South Dakota State University). 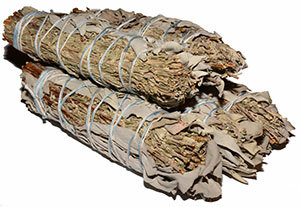 These bundles average about 12-14 inches in length and about 1¼ inches wide. 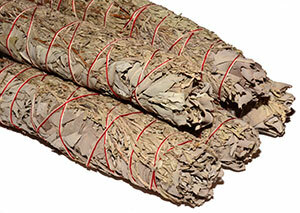 Badlands Sage smudge bundles are made for us by a Lakota family in the summer months from sage they wildcraft on their land. 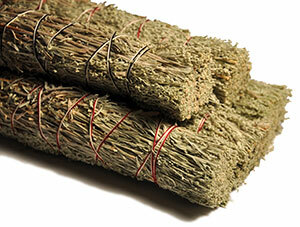 Big Sagebrush (Artemisia tridentata) is one of the most frequently used sages by Native Americans. It is found throughout the West, Northwest, Southwest, and Plains states. 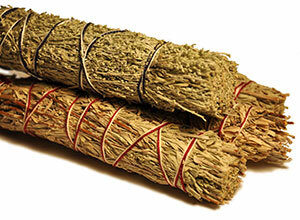 It was used medicinally by the Cahuilla, Diegueño, Flathead, Havasupai, Hopi, Navajo, Paiute, Salish, Zuni and others. Treatments varied from burning the plant and inhaling the smoke to making teas, and poultices. 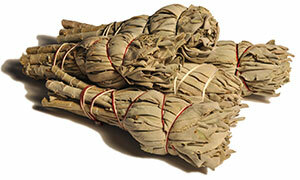 The Cahuilla called it wikwat and made a tea from the leaves for stomach disorders. Both the Cahuilla and Paiute collected the seeds as a food source to make a type of flour. Big Sagebrush was also used by some tribes as a building material, fuel source, and a plant to make yellow dye. Ceremonially, it was used by various tribes to become spiritually clean. 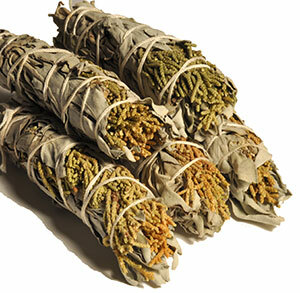 Today, the plant is used for smudging in the same manner as other sages. The scent of Big Sagebrush is often associated with the "West" because of its widespread presence in western plateaus and regions. 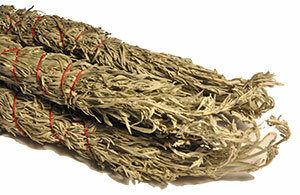 When dried in bundles, it has a somewhat “dusty sage” scent. But in the wild, if you are fortunate enough to experience a warm summer afternoon thunderstorm, the air can be filled with the unmistakable aroma of Big Sagebrush! 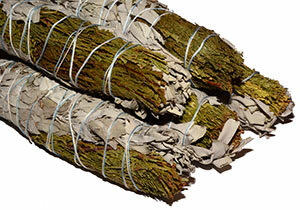 Our sage bundles are wildcrafted in California and average about 8 inches in length and 1½ inches in width. 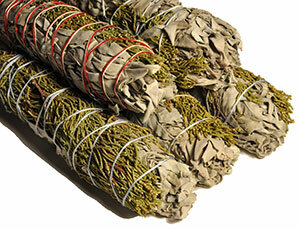 Our mini sage bundles are wildcrafted in California and average about 5 inches in length and 1 inch in width.